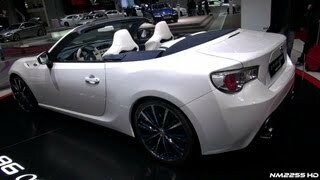 Toyota has announced to unveil the FT-86 Open Concept, based of its highly acclaimed GT86 sports coupe, at the 2013 Geneva auto show. 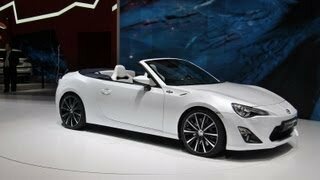 The concept is to manufacture the car with high performance, with the integration of dynamic abilities of the GT86. Its unique design and the colour scheme has been designed by the Toyota Boshoku Milan Design (TBMD) at Milan, to capture the real essence and ambience of the city. 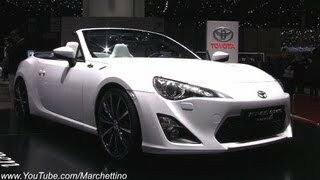 The FT-86 has been constructed on the same design and geometry of the GT86. The car is mounted with the horizontally opposed 1,998cc four cylinder “boxer” engine, equipped with Toyota’s D-4S direct injection technology which is capable of producing over 100bhp per liter. The cabinet is being crafted by the six-speed manual and automatic gear having theworld’s fastest paddle shift speed, leading to a fuel efficiency of 100 km in just 2.1 liters. The engine provides a maximum Torque of 205 Nm (151 lb-ft) @ 6600rpm and has a bore/stroke of 86 mm or 3.4inches. The Macpherson strut front and double wishbone rear suspension, delivers a highly powerful and instant level of control on the car. The electric power steering provides a decent 13.1:1 controlling ratio, but large ventilated disc brakes fore and aft deliver excellent pedal feel for car control finesse. The beauty from Milan, FT-86 Open, has enough possessions for holding the real ambience of Italy. The special pure bright white and navy blue colour combination with multi-layered fabric roof makes the car an ideal sports coupe. The dimensions of the i.e. length, width and height of the car are 4240mm,1750mm and 1270mm respectively. The interiors of the car are gloomed by the perforated white leather upholstery which is layered over a navy blue backing with golden yellow stitches.